Photograph of a section of an excavation at Brahmanabad in the Hyderabad District of Sind in Pakistan, taken by Henry Cousens in 1896-7. 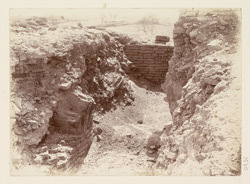 Cousens wrote in the Progress Report of the Archaeological Survey of Western India, 1897, "Deep excavation through the heaps of brick debris, which rise to 15 and 20 feet above the original street levels, revealed the fact that the foundations of all the upper buildings do not go any great depth into the mounds but are rather built upon them. It revealed more. Beneath the upper foundations, and with several feet of brick and earth debris between them, I found the foundations of older brick buildings. In the latter only the very old Hindu brick of great size was used, whilst in the upper walls a few of these were used with others of a far smaller size."